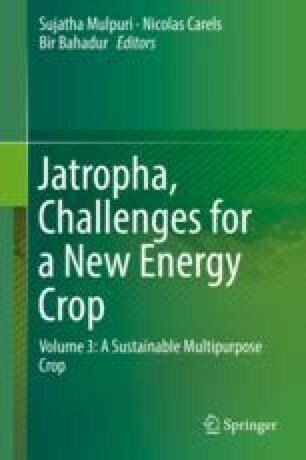 Jatropha curcas, a tropical and subtropical shrub/tree, has been emerging as a promising biodiesel crop because of its high oil content and ability to grow in marginal lands. The kernel cake is the major by-product of the Jatropha biodiesel chain, rich in protein and has potential to be used in livestock feed; however, the presence of anti-nutritional factors and phorbol esters limits its use. Thus, this report discusses on phorbol esters toxicity and risks and strategies for cake detoxification. Besides feeding application of J. curcas cake – that we see as a possibility of integration with biodiesel and food chains – we presented some other alternative uses.